We have not forgotten, we will never forget, the debt of infinite gratitude that we have contracted with those who gave everything for our freedom. Those are the words of Rene Coty, the president of France from 1954 to 1959, inscribed in the American Battle Monuments Commission’s Normandy American Cemetery Visitor Center in France. The Normandy American Cemetery is one of the 25 permanent American military cemeteries in foreign countries that the American Battle Monuments Commission (ABMC) maintains to honor the service, achievements and sacrifices of U.S. armed forces. Through newly released smartphone apps by ABMC, this iconic World War II site and others are now accessible to anyone wishing to learn more about these hallowed grounds. The Normandy American Cemetery app serves as a personal tour guide around the cemetery, where 9,387 Americans are buried in the grounds overlooking Omaha Beach. On June 6, 1944, D-Day, Allied forces changed the course of history with the successful invasion of France that marked the beginning of the end of World War II in Europe. ABMC also released a similar tour-guide app in February to service the Cambridge American Cemetery in the U.K., where 3,812 Americans who died in World War II are buried. American armed forces used Great Britain as a base of operations during the war, further solidifying the friendship and alliance between the two nations. 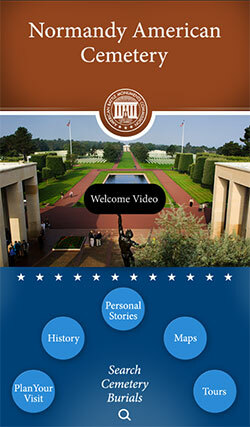 The Normandy American Cemetery app is available for iOS and Android tablet and smartphone devices. 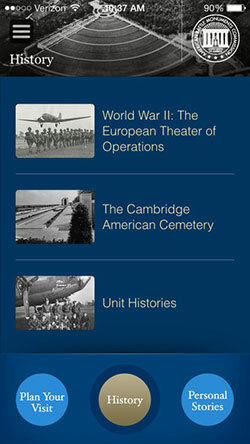 The Cambridge American Cemetery is similarly available for iOS and Android devices. These new ABMC apps, as well as the very popular Pointe du Hoc promontory app released earlier, help users learn the stories of the Americans buried overseas, explore the sites without needing to be physically present, and understand the U.S. military’s role in World War II. AMBC plans to release native applications for other sites later this year. You can download these and other cool mobile government apps with just a few clicks from our USA.gov Federal Mobile Apps Directory. Federal agencies can get their apps in the directory by using the Federal Mobile Products Registry.